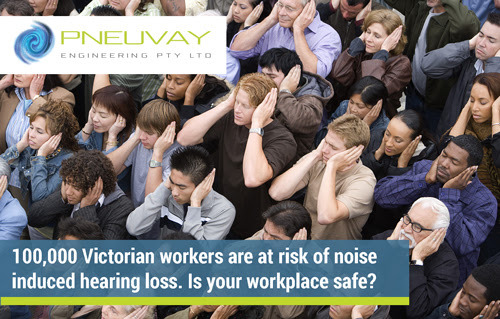 Approximately 100,000 Victorian workers are at risk of noise induced hearing loss. This is the statement given by WorkSafe Australia last year. Are you aware of your responsibility to prevent noise induced hearing loss? In its published article last April 2016 entitled, "Managing Noise and Preventing Hearing Loss at Work: Code of Practice," Safe Work Australia stated the responsibility of owners and designers, manufacturers, suppliers, importers and installers of plant structure to help avoid noise induced hearing loss in the workplace. 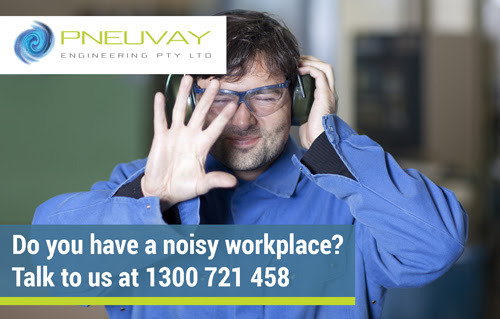 Need help with noise induced hearing loss risks in your workplace? Call us. 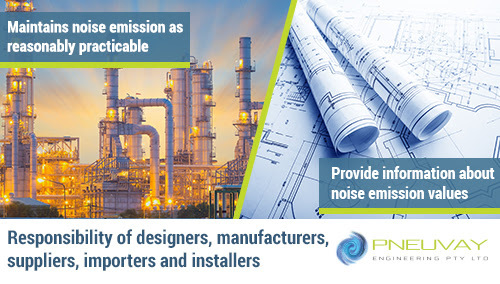 Designers, manufacturers, suppliers, importers and installers of plant or structures have the responsibility to ensure the plant or structure is designed and manufactured so that its noise emission is as low as reasonably practicable. They should also provide information about noise emission values of the plant and other conditions needed that could help minimise the risk of hearing loss and other harm. 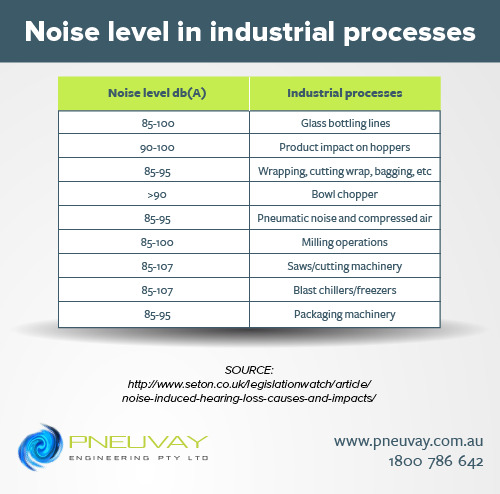 What industries are exposed to high noise level? Do you belong to these industries? However, due to this it doesn't have a separate lubrication system, causing some models to produce a high decibel level. Pneuvay Engineering designs and manufactures blower systems that have minimal noise. Moreover, we also provide blower enclosures that can further reduce the noise emission level of your blowers. Talk to us to learn more about it. This means that an exposure standard of 85 dB is the minimal noise a person can endure to avoid hearing loss. In cases where noise levels go beyond 140 dB, such as impact or explosive noises such as sledge hammering or a gunshot, then it would only take less than a second to bring damage to a person's hearing. Average noise level of pneumatic and compressed air is at 85 to 95 dB. 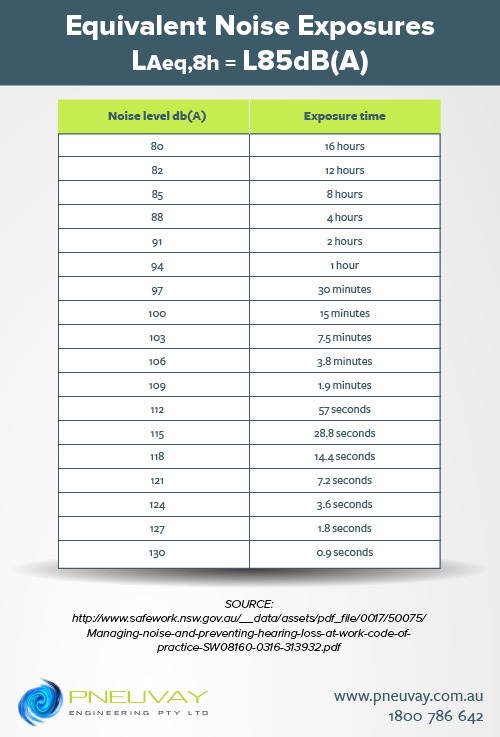 The table of equivalent noise exposures shows that workers can only be exposed to 85dB for a max of 8 hours, 88dB for a max of 4 hours and 90dB for a max of 2 hours. Given this information, noise should be kept at 85 to ensure workers exposed to this noise will avoid noise induced hearing loss. Otherwise, their exposure to systems and equipment with higher degree noise level should be kept at a maximum of 2 hours. How to reduce noise in the workplace? Technically speaking, there are two ways of minimising noise in the workplace - eliminate or minimise it. Assessment of plant, equipment and other sources of noise in operation at the workplace will help you identify machines that can be eliminated. Some of these may be too old or even out-dated it has to be replaced with more efficient systems and machines. Pneuvay Engineering designs pneumatic systems to ensure a more efficient production process in your workplace. Contact us to schedule an appointment with us. In choosing quieter systems or equipment, it is best to enquire about noise emission information. Compare the data of similar equipment and choose the best supplier who can demonstrate a low noise design, with noise control as a standard part of the machine, not as an optional extra. Blowers and industrial vacuum systems are essential for most plants and factories. However, use of these poses your workplace to a higher degree of noise. Use of blower enclosures can greatly reduce the noise level in your workplace. 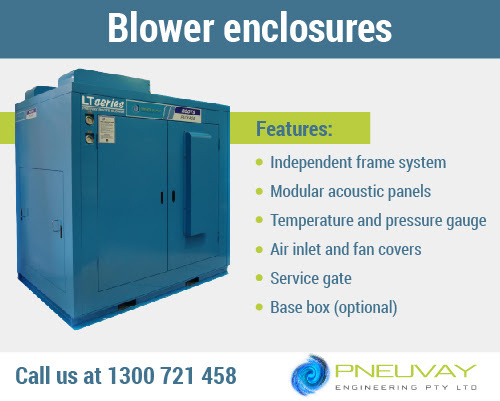 Take for example Pneuvay Engineering's blower enclosures that can guarantee 18 to 15 dBA noise reduction. We can achieve results down to 80 dBA. 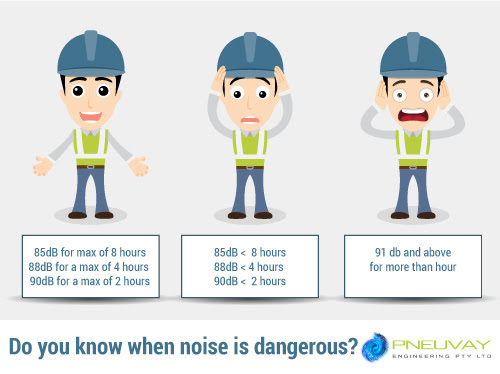 However, to get noise down to lower levels may require us to engage specialist noise engineers to plan in dealing with possible complications such as reflective sound from nearby surroundings. Talk to us, today.